HÀ NỘI — The price of pork in Việt Nam is set to keep rising over the next few months due to African swine fever devastating pig populations. The Import-Export Department under the Ministry of Industry and Trade said last month, the price of live pigs hit VNĐ45,000-51,000 per kilo in the north, VNĐ45,000-52,000 per kilo in the central region and VNĐ52,000-54,000 per kilo in the south. The price of pork in October doubled against its price during the same period last year, reaching a record high over the past few years. Earlier, huge demand stemmed from the reduction in pig production after an oversupply of pork in early 2017 led to huge losses for farmers. According to Nguyễn Xuân Cường, minister of Agriculture and Rural Development (MARD) pig breeding cost is VNĐ35,000-36,000 per kilo while the average selling price for live pigs is VNĐ50,000 per kilo. High pork prices could pose a risk of more imported pork entering Việt Nam, he said. In reality, pork prices in recent months increased by 200 per cent compared with the middle of 2017. Nguyễn Xuân Dương, director of MARD’s Department of Livestock, claimed Việt Nam has been one of the countries with the highest pork price in the world. The ministry therefore sent a document to chairmen of provincial People’s Committees to provide regular information on pork price and supply while asking breeders and traders to help stablise the market. Việt Nam ranks sixth globally in term of pork output. According to the United States Department of Agriculture (USDA), pork output worldwide in 2019 would be increased by 1.4 per cent from this year. 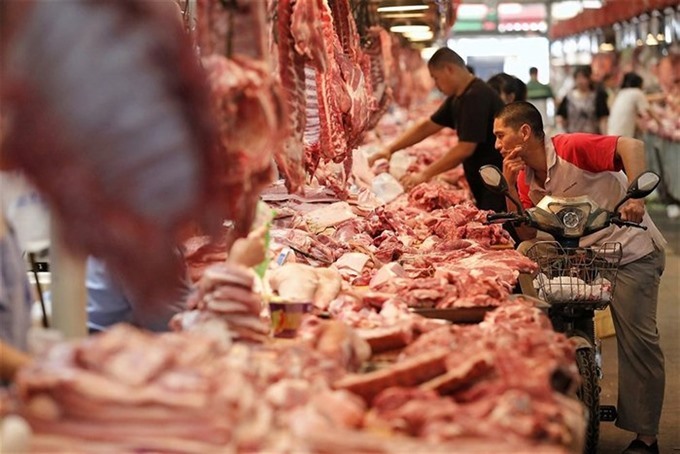 China is expected to continue to be the biggest pork producer in the world. Its pork output in 2018 was estimated at 433.25 million tonnes, accounting for 48 per cent of the world’s total output.